Originally flour kneaded with water in large tanks called fermentors. The dough is then pressed through the holes (suitable molds molds) and gets the desired shape (spaghetti, orzo, tubbeti, etc.). Then the pasta is put in a closed chamber in which hot air is blown, and dried. Drying is done to keep the pasta for a long time without refrigeration, maintaining the quality and nutritional value. After cooled to reach room temperature, to be packaged. Finally, packaged in cellophane and then placed in boxes and pallets are available to the general public. 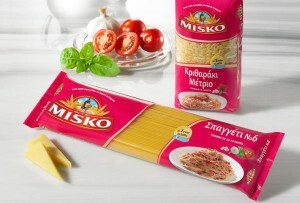 The MISKO is the largest brand of pasta in Greece, with a long history and adiamfisviti quality. With innovative spirit and modern philosophy, MISKO listens to the pulse of the market and the needs of the Greek consumer always working consistently to ensure the high quality of its products at all levels. For this, the MISKO is firmly at the top of the Greek pasta market due to consumer confidence inspires us and encourages us to become better.